For a moment, allow me to digress and mention cataracts and cataract surgery. As we age, many tissues in our bodies begin to deteriorate. Our hair goes gray and our backs ache. The lenses in our eyes also deteriorate. The deterioration of the lens first shows up in our forties as presbyopia. Then, sometime after we turn sixty, we start to develop cataracts. 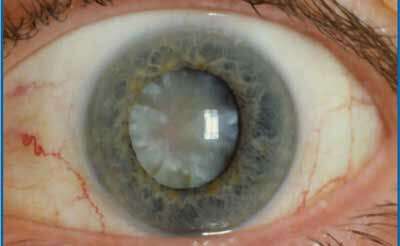 A cataract is haziness in the natural lens of the eye (Figure 25). It causes hazy vision, like looking through waxed paper or a very dirty windshield. Everyone gets a cataract eventually, if they live long enough; it is as certain as gray hair. Nowadays, cataracts are easily treated with cataract surgery. In cataract surgery, the hazy natural lens of the eye is removed and replaced with a clear lens. Why the digression about cataract surgery in a chapter on refractive lens exchange? Because cataracts involve the same operation performed for refractive lens exchange. No doubt you know someone who has had cataract surgery—it is the most common surgical procedure performed in the United States, with more than 3 million procedures performed annually, refractive lens exchange is simply cataract surgery performed on an eye where there is no cataract. In fact, one of the great advantages of RLE is that it uses the same advanced technology and proven techniques that have been used for years in cataract surgery. Figure 25. A cataract is a clouding of the natural lens of the eye. It makes vision blurry and is treated by replacing the cloudy lens with an intraocular lens. A significant advantage of RLE is that you can never get a cataract because your natural lens has been replaced by a synthetic lens that will never get hazy. You will never need to have cataract surgery in the future. That’s nice because that’s one aging problem taken care of that you won’t have to worry about later, when perhaps you aren’t as healthy. With refractive lens exchange, you are basically killing two birds with one stone—eliminating the need for glasses now and the need for cataract surgery later. Many farsighted people in their fifties and sixties choose to have refractive lens exchange before cataracts have a chance to develop. These people don’t want to wear eyeglasses or contacts, and they choose not to have other forms of refractive surgery, such as LASIK, because within a few years they might well need cataract surgery anyway. With RLE, just as with cataract surgery, your surgeon will explain the choices you have in choosing an intraocular lens. The author with a big fish! The top photo shows colors as seen with a normal eye. 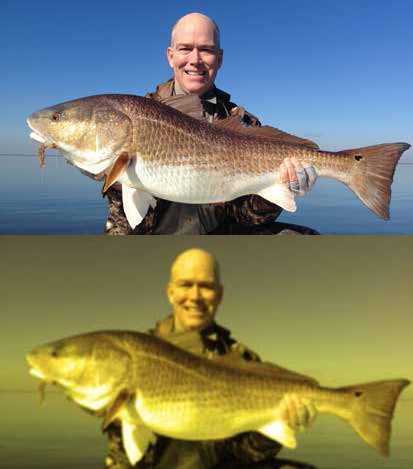 The photo on the bottom shows colors as they may appear with a cataract.